For teachers it’s never the question of whether to teach reading or science, but rather the question of how to teach both subjects so quality learning occurs in both disciplines. 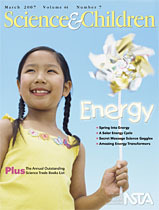 This issue provides creative ideas for using trade books and writing techniques to help students make deeper connections to science content as they develop language arts skills. Who but elementary teachers could create such authentic and exciting ways to connect science and math in the classroom! This month, let your students take a Geometric Scavenger Hunt, race Lego cars, explore volume with popcorn, and graph, graph, graph. When instruction is coordinated in both science and math, understanding in both disciplines is enhanced. Studying animals can help hone inquiry skills, but most importantly, animals can help children care—about themselves, others, and the environment. Read on for creative ideas on how to bring the animal world to your students! It’s summertime—and what better time to get wet and investigate water! From the water cycle to virtual snowflakes, and everything in between, the articles in this issue provide a host of practical activities for examining this essential resource with students. This issue celebrates the many creative ways your colleagues are teaching science content that encourages students to be stewards of the environment. When you think of integration and science, there's no need to limit yourselves to the "basics"—i.e., reading, math, and social studies. The articles in this issue highlight teachers who’ve found terrific ways to integrate science creatively—and effectively—with music, art, and more. Let's hear it for young scientists! This issue highlights classroom experiences that foster inquiry learning. From developing students' questioning skills and beefing up their observation skills to helping primary students make sense of their observations, these articles help you lay a foundation for science.